To Cite: Cunha A C D, Marquezan M, Issamu Nojima L, Franzotti Sant’Anna E. Evaluation of Mechanical Performance of Orthodontic Mini-Implants With Distinct Designs, Iran J Ortho. 2017 ; 12(1):e6527. doi: 10.5812/ijo.6527. Background: Orthodontic mini-implants represent one of the most used anchorage systems in daily clinical practice and frequently, these anchorage devices have to be placed between the roots of adjacent teeth reflecting the need to limit its dimensions. Among other factors, it has been suggested that mini-implant’s geometry have a great impact on primary stability. Objectives: The aim of this study was to evaluate the primary stability (PS) of commercially available orthodontic mini-implants (MI) of different geometrical designs. Methods: Twenty self-drilling MI (1.6 mm × 8 mm) were allocated to two groups (n = 10) according to their geometric design: INP-1 and INP-2. Twenty sections (8 mm ø × 10 mm long) were taken from bovine pelve, immersed in saline solution and stored by freezing (-20°C). 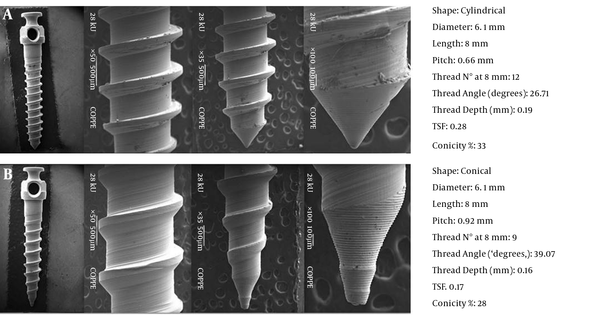 Geometric characteristics concerning shape, diameter, length, pitch, thread details (number, angle and depth), thread shape factor (TSF) and conicity were evaluated by using Scanning Electron Microscope (SEM) imaging and all the measurements were carried out with Image-Pro® Insight Software. PS was evaluated by insertion torque (IT) and Periotest (PTV). Intergroup comparisons were made by Student t test. The level of significance was 5%. Results: Increased IT values were observed for INP-1 (20.08 ± 3.28 N.cm) (P < 0.05), the group that presented the greatest conicity (33%) and highest thread depth (0.19 mm). Conclusions: The wide geometric variability of MI indicates that MI design parameters affect its PS and it could be selected in order to improve its mechanical performance. Mini-implants (MI) have conquered space in the orthodontic field over other skeletal anchorage systems because of several advantages: versatility (due to their reduced dimension), minimally invasive insertion and removal procedures, early loading after implantation and reduced costs (1-4). However, the success rate of these anchorage devices is still unsatisfactory: about 80% (5) and 83.6% (6, 7); indicating the need to improve the stability of mini-implants in order to achieve more predictable outcomes. The risk of MI loss is reduced if primary stability is optimized (8, 9), since limited osseointegration is expected due to avoiding high removal torques (10). It has been suggested in the literature that bone properties, mini-implant geometry (shape, diameter, length, thread form and pitch) and surgical technique have a great impact on primary stability (11-20). Since no optimal design has been defined yet, each parameter could contribute to upgrading mini-implant performance, thereby enhancing mechanical stability, strength and load transfer (1, 21, 22). The objective of the present study was to characterize distinct mini-implant design parameters and evaluate their effect on primary stability. Twenty self-drilling commercially available mini-implants made of Ti-6Al-4V alloy (1.6 mm × 8 mm) were used, and allocated to two groups (n = 10) according to their geometric design: INP-1 and INP-2 (Mini-implants for orthodontic bracket anchorage, INP® system, Sao Paulo, Brazil).The number of samples was calculated using the sample size data of a previous pilot study (α = 5%, power of study = 80%). Twenty sections (8 mm ø × 10 mm long) were removed from the pubic region of bovine hip pelve (Bos Taurus indicus, Nelore lineage) with a trephine bur (8 mm ø × 20 mm long, Sin Implants, Sao Paulo, Brazil) and stored by freezing (-20°C) (23). The specimens presented approximately 1 mm of cortical, measured by means of a caliper gauge (Dentaurum GmbH and Co. KG, Ispringen, Germany), abundant trabecular bone volume and homogeneous morphometric parameters, such as bone volume fraction (BV/TV) (30.32% ± 7.96) and mineral density (BMD) (1.27 ± 0.26), according to Marquezan et al. 2014 (24). The mini-implant geometric design was characterized by using scanning electron microscope (SEM) imaging (JEOL JSM-6460LV, JEOL USA Inc.). Photomicrographs at 10x, 35x, 50x and 100x magnification were taken in order to obtain general information (shape, diameter and length) and other details that are not disclosed by the manufacturer, such as pitch, number of threads, thread angles, thread depth and conicity (Figure 1). All the measurements were made with Image-Pro® Insight Software (version 8.0.3, Media Cybernetics, Inc., USA). Figure 1. 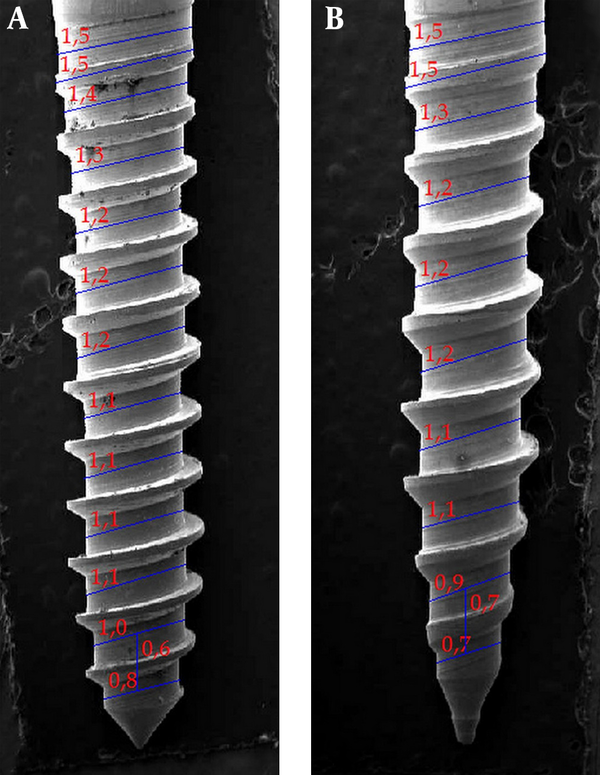 SEM magnifications of the entire mini-implants (10x), thread and shank details (50x and 35x) and tip (100x) with design characteristics and measurements, A, INP-1 group; B, INP-2 group. Pitch, thread angles and depth measurements are illustrated in Figure 2. The relationship between the pitch (P) and thread depth (D) was estimated by the thread shape factor (TSF) (TSF% = D/P) (25). The degree of conicity (C) was obtained by dividing the difference between two shank section diameters by the pitch (C% = d1-d2/P). As demonstrated in Figure 3, cylindrical MI conicity values referred exclusively to its tip, while conical MI presented a broader tapering. The highest value of the degree of conicity was considered for each MI group. Figure 2. SEM at 50x Magnification and Thread Details Measurements, A, INP-1 group; B, INP-2 group. Figure 3. SEM at 10x Magnification and Degree of Conicity Measurements, A, INP-1 group; B, INP-2 group. The mini-implant sites were predrilled with a lance (Orthodontic Kit, INP® system, Sao Paulo, Brazil) to a depth of 1 mm. Insertion was performed by a single operator with the use of a manual key connected to a digital torque meter (Lutron TQ-8800, Taipei, Taiwan). Each mini-implant was inserted until all threads were fully contained in the block. A mechanical device was used to align the torque meter, mini-implant and the bone blocks, maintaining the system in a perpendicular relationship. The peak insertion torque values were recorded in Newton centimeter (Ncm). Mini-implant mobility was evaluated with the Periotest® instrument (Medizintechnik Gulden, Modautal, Germany). A special acrylic device was used to fix the sample and Periotest® handpiece, and to standardize the distance between the sleeve and the mini-implant (26). The handpiece was calibrated by means of plugging the test sleeve supplied by the manufacturer onto the tip of the hand unit. After the measurement, the value obtained should correspond to that stated on the test sleeve to within +/- 2 Periotest units. Two recordings were collected for each mini-implant (the second measurement aimed to confirm the first one), and the average value was designated as the Periotest value (PTV), which is on a scale from -8 to + 50. The smaller the PTV is, the smaller is the mobility and the higher is the primary stability. Data were evaluated with the SPSS software program (version 18, SPSS Inc, USA). The normality and homogeneity of variables were verified by the Shapiro-Wilk and Levene tests. Intergroup comparisons were made by Student t test. The level of significance was 5%. Descriptive statistics (mean and SD) and intergroup comparisons for primary stability are shown in Figures 4 and 5. INP-2 group presented lower IT values: 15.57 ± 2.96 Ncm. Increased IT values were observed for INP-1 group (20.08 ± 3.28 Ncm) (P < 0.05), which is a cylindrical MI and presented the highest degree of conicity (33%) and TSF (0.28%). This group presented the lowest pitch value (0.66 mm). Figure 4. Boxplot and Student t Test Results for Insertion Torqu, Different letters indicate statistically significant difference at α = 0.05%. IT, Insertion torque. Figure 5. Boxplot and Student t Test Results for Mobility, Different letters indicate statistically significant difference at α = 0.05%. PTV, Periotest value. The most perceptible mobility (10.05 ± 6.83) was noted in the INP-2 group, a conical MI with a TSF of 0.17%. 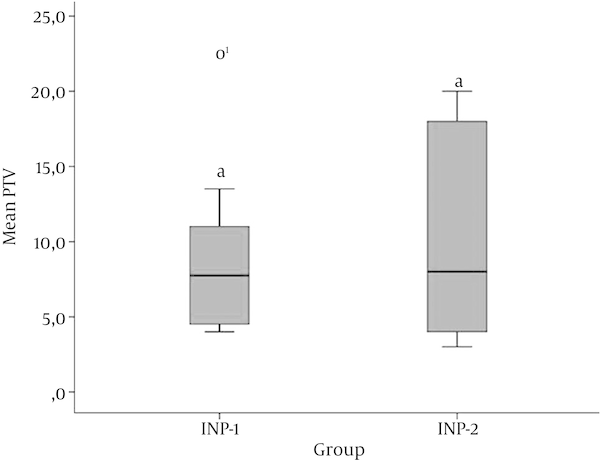 However, this difference was not statistically significant in comparison to INP-1 group (9.15 ± 5.65) (P > 0.05). With regard to bone morphometric assessment, Rebaudi et al, 2010 proposed a mathematical formula to calculate HU (Hounsfield Units) from BV/TV% microCT measurements (HU = 20.5 x BV/TV% - 190). According to this mathematical model, the bone volume fraction of bovine pubic bone (30.32%) (24) is equivalent to 431.56 HU, which corresponds to values usually found in human bone of lower density, such as the maxillary tuberosity (27). Irrespective of using self-drilling mini-implants, the cortical thickness of all implant sites was pre-drilled in order to reduce their insertion resistance (11, 28). Furthermore, we reproduced this procedure in our study because it is one commonly used in clinical practice, since the perforation site stabilizes and guides the initial insertion phase (29). Due to orthodontic treatment mechanics, mini-implants frequently have to be placed between the roots of adjacent teeth, which indicate several restrictions in their dimensions (especially diameter and length). This shows the importance of the geometry for improving primary stability (1, 11, 14, 17, 30, 31). Analysis of how mechanical stability is related to mini-implant geometric parameters could provide accurate data (32) and contribute to elaborating new design features. Primary stability indicators are considered great predictors of successful mini-implants because it represents satisfactory fixation of the implant to the bone site (13, 33) such as IT, which consists of a long-axis assessment of the mini-implant/bone resistance and PTV that measures mini-implant micromotion after placement (24). Considering that these trials are conducted in different directions, the outcomes obtained may not represent a convergent, but a complementary relationship. The INP-1 group presented the highest values for both conicity and insertion torque (33% conicity; IT: 20.08 ± 3.28 N.cm) (P < 0.05) and also lower thread angle values (26.71°). In clinical practice, this might suggest that MI with greater conicity degree and lower thread angles should be considered when a higher IT is necessary. INP-1 group also presented higher thread depth and lower PTV values (9.15 ± 5.65). With the proviso that this difference was no statistically significant in relation to INP-2 group (P > 0.05), this result is suggestive that MI with higher thread depths may present lower mobility. Since the PTV measures stability in the latero-lateral direction, MI lateral mobility may be reduced if the thread depth is increased, which is extremely relevant from the clinical point of view. As regards geometric aspects, all the groups presented the same dimensions (diameter and length) in order to investigate the real influence of the other parameters: conicity, pitch, number of threads, TSF and shape on primary stability. The thread shape factor has been associated with a great impact on primary stability (34). Mini-implants from INP-1 group presented the highest TSF (0.28%) and IT, corroborating the findings of this previous study. Previous studies indicated that tapered mini-implants were associated with higher IT (9, 17, 35, 36). However, despite its cylindrical shape, INP-1 group presented the highest IT. This finding indicates that mini-implant shape may be strongly influenced by the TSF, suggesting that even a cylindrical MI could present higher IT values if its TSF were enhanced. The main limitation of this research concerns the in vitro study design, which was selected to restrict possible confounding factors and allow better understanding of the influence of geometric parameters on mini-implant mechanical properties. Further studies evaluating the performance of these mini-implants in different bone substrates could be helpful guidance as regards their clinical selection. A great variability in the geometric characteristics of MI was observed. MI with higher conicity degree and thread depth presented greater IT. On the basis of the present outcomes it is assumed that MI design parameters could be strategically matched, in order to improve its performance, according to insertion site characteristics and clinical demands concerning the directions of the forces applied. The authors would like to thank Dr. Inaya Lima and Dr. Ricardo Tadeu Lopes for their contribution to the Master’s thesis that served as a basis for this and other papers. Authors’ Contribution: Amanda Carneiro da Cunha participated in study concepts and design, data acquisition, analysis and interpretation, statistical analysis and manuscript drafting; Mariana Marquezan was involved in study concepts and design, data acquisition, analysis and interpretation, statistical analysis, manuscript drafting and critical revision; Lincoln Issamu Nojima participated at data analysis and interpretation, critical revision and administrative, technical and material support; Eduardo Franzotti Sant’Anna contributed to the study concept and design, analysis and interpretation of data, manuscript drafting and revision, study support and supervision. Financial Disclosure: The authors report no financial interests. Funding/Support: This study was supported by the Brazilian government agencies CAPES (Coordenacao de Aperfeicoamento de Pessoal de Nivel Superior) and FAPERJ (Fundacao de Amparo a Pesquisa do Estado do Rio de Janeiro / N: E-26/111.798/2012).